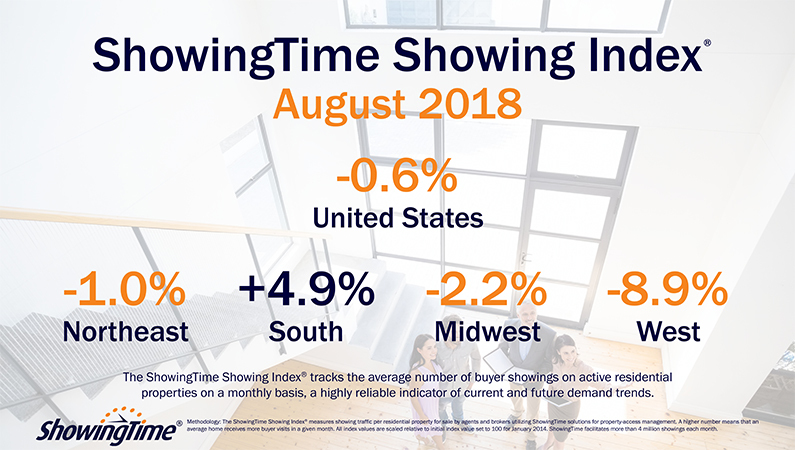 Seasonal Slowdown in Showing Activity Arrives Throughout Much of U.S.
Sept. 20, 2018 – The residential real estate industry’s seasonal slowdown arrived early this year, as the U.S. ShowingTime Showing Index® revealed that showing traffic throughout the country slowed from last year’s record highs for the fourth consecutive month after more than a year of increasing activity. The August 2018 national index dropped just below even with last year’s mark, declining 0.6 percent compared to August 2017. This marks the fourth straight month the index has measured only slight changes in showing activity, averaging a 0.3 year-over-year increase during that time period. The previous nine months averaged a 5.6 percent year-over-year increase. The national index falls in line with waning showing traffic throughout much of the country. The West Region experienced a year-over-year decrease for the seventh consecutive month, as showing traffic declined 8.9 percent compared to August 2017, while the Northeast (-1.0) decreased for the fourth consecutive month. Showing activity in the Midwest also fell 2.2 percent compared to last year. The South Region, meanwhile, continued to experience heightened showing traffic in August as activity increased 4.9 percent compared to last year. It’s the eight consecutive month showing activity in the South has outpaced the national index. Next month’s index – particularly for the South Region – could be impacted by Hurricane Florence, which made landfall on Sept. 14.